She afflicts me! She comes to me at night and torments me! She's a witch! 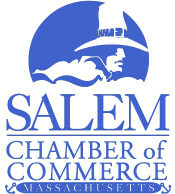 In January of 1692, the daughter and niece of Reverend Samuel Parris of Salem Village became ill. When they failed to improve, the village doctor, William Griggs, was called in. His diagnosis of bewitchment put into motion the forces that would ultimately result in the death by hanging of nineteen men and women. In addition, one man was crushed to death; seventeen others died in prison, and the lives of many were irrevocably changed. 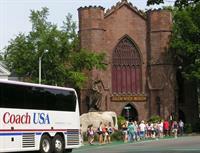 The Salem Witch Museum brings you there, back to Salem 1692. 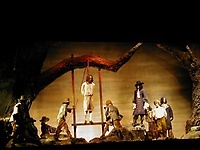 Visitors are given a dramatic history lesson using stage sets with life-size figures, lighting and a narration - an overview of the Witch Trials, which consumed Salem, Massachusetts. In our exhibit, Witches ?Evolving Perceptions, our guests come away recognizing that the accused ?witches? of 1692 were no different than the Japanese-Americans encamped during World War II and blacklisted Communist of the 1950s. All are challenged to think of Witch-Hunts taking place today. 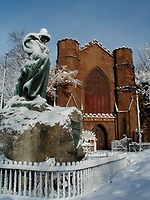 The Museum is open daily year-round and is closed on Thanksgiving, Christmas and New Year's Day. We are group friendly and the Museum is translated into French, German, Japanese, Spanish, Italian, Russian, Cantonese and Mandarin. Our website is where you?ll find links to our online store and our YouTube Channel which features ''Witch Trials Weekly'', 49 episodes covering the events of 1692.